The room was packed Monday, March 24th, for a meeting of the Economic Development and Intergovernmental Relations Committee as Councilman Todd Gloria successfully gained approval to draft ballot language on a measure proposed for the November ballot raising the minimum wage and granting paid sick leave for San Diegans. Gloria will consult with City Attorney Jan Goldsmith and bring the measure back for consideration by the committee on April 30th. We can only hope the City Councilman president has the language double-checked by an outside attorney who doesn’t have a vested ideological interest in the measure failing. A coalition of faith-based, community and labor groups called Raise Up San Diego! turned out over 100 people carrying neon green signs expressing support for the concept yesterday. They’ll need to keep the pressure on until the full council takes a vote (no later than the end of August) for the measure to appear on the ballot. Opponents to the idea of raising the minimum wage locally are taking the “we need to study it” approach for the time being. 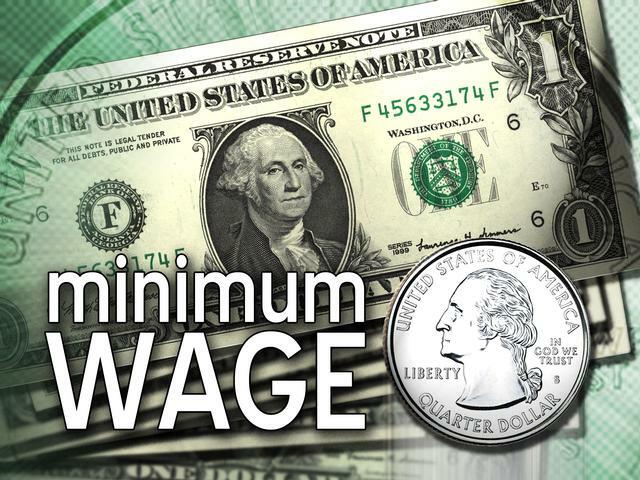 “Many of whom a­­­re very concerned about an increase in the minimum wage above and beyond what the state just approved last year. We ask that an independent study be done to first determine the economic impact on the business climate in the city of San Diego,” Rhinehardt said. The study idea is, of course, a delaying tactic. There are a multitude of studies out there with results oriented towards whomever paid for the research. And one more study wouldn’t change anything, other than say, the timing of such a measure to a low turnout date where the Chamber and their allies might have a chance of influencing the results with a JOB KILLER advertising campaign. Recent pollshave shown that only tea party Republicans oppose the minimum wage hike, while non-tea party Republicans actually are in line with majorities of the American people, and support it. But the latter’s priorities just aren’t reflected to anywhere near the same degree by the Congressional GOP. On the national level, one of the leading opponents of increased minimum wage legislation being considered by the states, is the National Federation of Independent Businesses(NFIB). The group typically portrays itself as the voice of American small businesses. The fact that they’re received $2.5 million from the Freedom Partners Chamber of Commerce, a conservative advocacy group with deep ties to the Koch family is, I guess, supposed to be of no importance. And we’re not supposed to notice that four of the five men sitting on the NFIB board are current or former employees of Koch companies and that one is a friend of Charles Koch. In fact, their actual constituencies don’t agree with NFIB’s priorities. …its own members aren’t so focused on the issue: Buried inside a big roundup report on the issue is a survey of business owners — and they say they aren’t actually worried about sick days or minimum wage. In its most recent survey of the small businesses that make up its membership, from 2012, they ranked “Minimum Wage/’Living’ Wage” at number 52 out of 75 issues — well in the last third. On top of this, just 8.6 percent said this issue is “critical,” while 28.8 percent said it wasn’t even a problem. The group has also opposed paid sick days, but that ranks even lower among its members. “Mandatory Family or Sick Leave” is number 64, below regular crime as well as cyber crime, with 7.8 percent deeming it critical and 35.1 percent saying it’s not a problem. Yet it conducted a study saying that enacting paid sick days in Massachusetts would cost 16,000 jobs and testified against a measure in Illinois. …according to Josh Goldstein, a spokesman for the AFL-CIO, DeMint’s office has said he doesn’t have the time to do the debate. Goldstein adds that the AFL-CIO told DeMint’s staff that Trumka would be happy to do this wherever and whenever DeMint wants to, but to no avail. Now the AFL-CIO will seek to draw attention to DeMint’s unwillingness to debate, with a new Facebook page and other social media, as a way of making the broader point that even those who are most ideologically committed to opposing the federal minimum wage know it is a very hard position to defend. The above is an excerpt of Doug Porter’s daily column.